Following is a checklist of procedures you must complete in order to make your experience at Indiana State as successful as possible. If you have questions, contact the office listed or the Office of Admissions toll free at 800-GO-TO-ISU. As a newly admitted student, your student email is the official form of communication from the university. To access your email, you need to activate your University Username on the MyISU portal. Click on “Activate Your University username​.” You will need your University ID number (found on your letter of admission), your date of birth, and the last four digits of your Social Security Number. Access your report through the MyISU Portal. This report details all of your transfer hours accepted by the University as well as course work you must complete to finish your Indiana State degree. For instructions visit Degree Plan. Visit Residential Life to see when the application for the 2019-20 year is available. You must first activate your MyISU portal before starting the housing application. Apply for federal and state financial aid by completing the Free Application for Federal Student Aid (FAFSA) at www.fafsa.ed.gov. (The federal school code for Indiana State is 001807.) We have information on all aid programs available online at www.indstate.edu/finaid or contact the Office of Student Financial Aid at 800-841-4744. As a new student, you are required by the State of Indiana Department of Health to complete and return health and immunization documents prior to registering for classes. For further information contact the Office of Registration and Records at 812-237-2020. Indiana State is an approved veterans benefits institution. For basic information on eligibility, visit Veterans' Benefits. 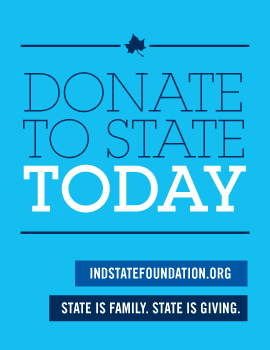 Call 812-237-2700 or visit www.indstate.edu/cfss. The University makes every effort to provide reasonable accommodations. Before starting classes, you’ll meet one-on-one with academic advisors and gain insight into navigating student life at Indiana State. You must maintain an acceptable record through the completion of your current studies. Your admission is subject to cancelation if your final transcript indicates a significant decline in your academic achievement. You are required to notify the Indiana State University Office of Admissions if you have registered, enrolled, or attended any other institution not listed on your admission application.